The 3rd Global Cyber Security Leaders Summit is an interactive, invitation-only, event that will bring together senior level IT and Cyber Security executives from across the globe to discuss various key topics and share business experiences through specifically-designed sessions within a comfortable and luxurious atmosphere. Stay ahead of Tomorrow's Cybersecurity Challenges! The cyberspace has undeniably become the most fundamental infrastructure to do business globally. With the rise of cyber threats and incidents the role of information technology and security has dramatically changed, meaning that today’s cyber security is no longer solely owned by and the responsibility of the company IT department. In addition to the difficult call between privacy concerns, regulation imperatives and security needs, the strategic importance of the CISOs, CIOs, CTOs roles have also changed to adapt to the constantly evolving playing field. Artificial Intelligence: Cyber Security Friend or Foe? Ransomware on the Rise: What to Do? 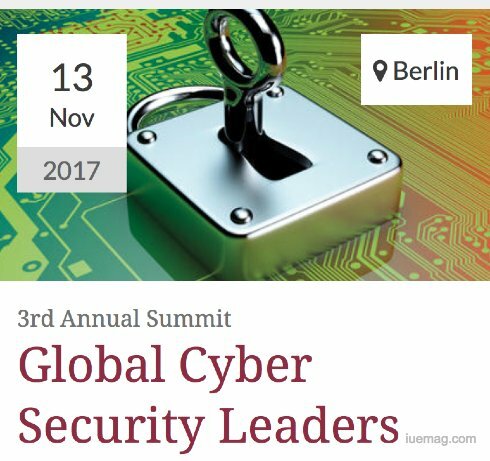 Have a look the latest list of speakers confirmed for the Global Cyber Security Leaders 2017 and join other top level executives in Berlin by signing up with the media partner discount today. Readers of the iU eMagazine save 25% with the code GLS5IUE. We would like to personally invite you to join this crossroad of cutting-edge knowledge, thoughts and inspirations. The iUeMagazine team is delighted to work with Global Cyber Security Leaders Summit as Online Media Partners & is expected to bring Unlimited Inspiration for all readers from the proceedings of this event. Staying tuned to the enriching updates from this event is recommended. Any facts, figures or references stated here are made by the author & don't reflect the endorsement of iU at all times unless otherwise drafted by official staff at iU. This article was first published here on 19th July 2017.